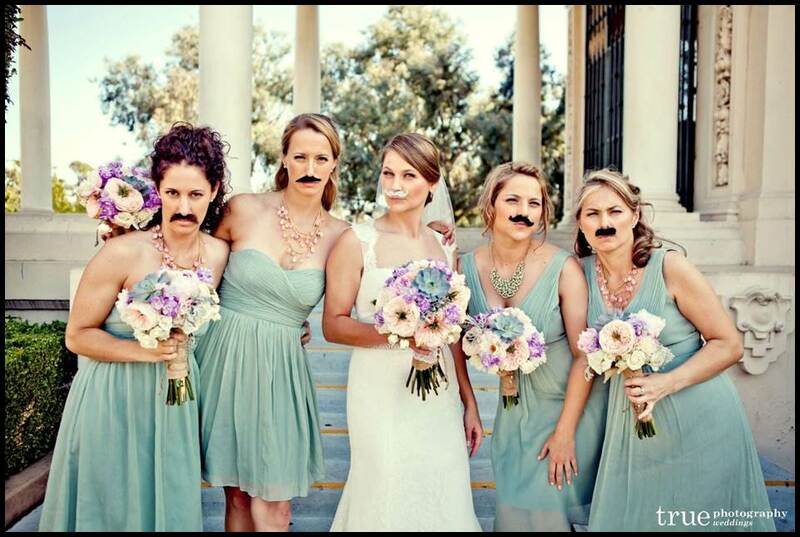 Come one, come all to the biggest, eco-chic-est mustache bash of them all….Your wedding! 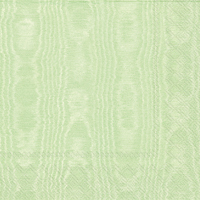 Use this popular motif to design a green wedding as unique and eco-chic as you are! Whether you want a subtle or a strong ‘stache influence, our green event expert has tips and tricks for turning your big day into the “Stache Bash” of your dreams! With Halloween right around the corner, I decided to highlight a wedding theme which is designed to bring out the kid in all of us. 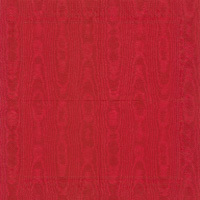 It also is one of the easiest to get grooms on board with! ☺ The mustache - that popular disguise for both spies and superheroes alike – has gained meteoric mainstream popularity over the past few years. You see it everywhere from tattoos to baby blankets and everywhere in between. 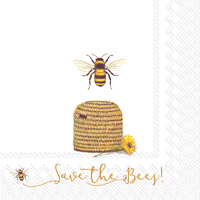 Brides and grooms can utilize this prominent, quirky and fun icon in their big day as a subtle or strong wedding theme. Incorporating the mustache into your ceremony décor is so easy. Just start with a basic black and white color scheme, throw in a pop color like red or purple and then concentrate on incorporating the mustache shape into the décor. The rounded top and drooping sides of the typical mustache mimics that of a traditional garland or swag. 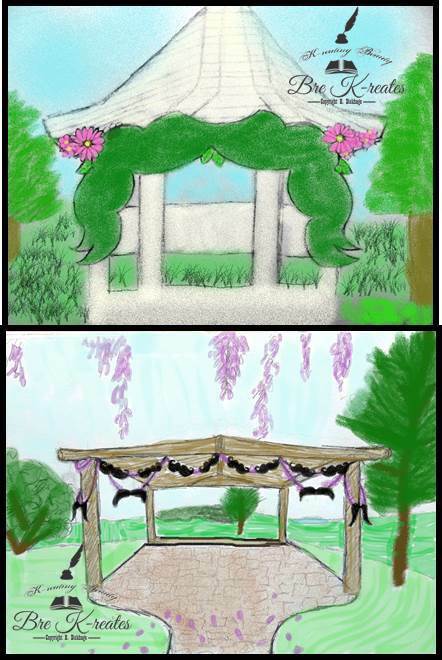 You can be subtle and make your mustache swags out of local greenery or fabric or be literal and make a swag of reclaimed wood or paper 'staches to say your vows under. 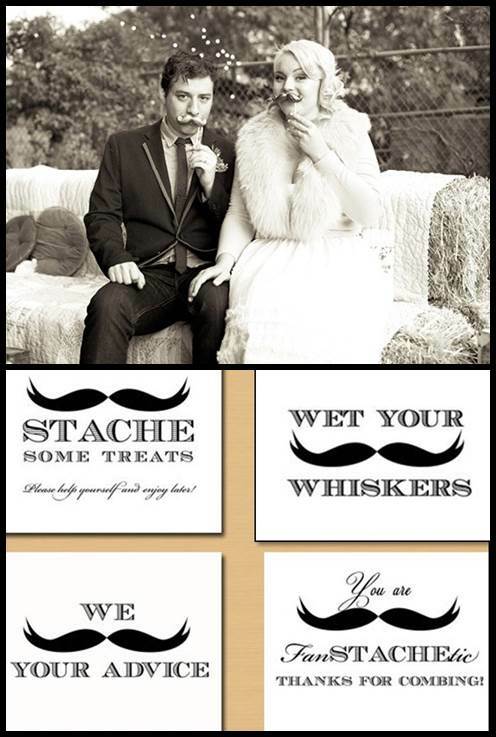 You can also use the mustache motif on your invitations and signage, and even along the aisle by placing hanging wooden mustaches on traditional shepherds hooks. 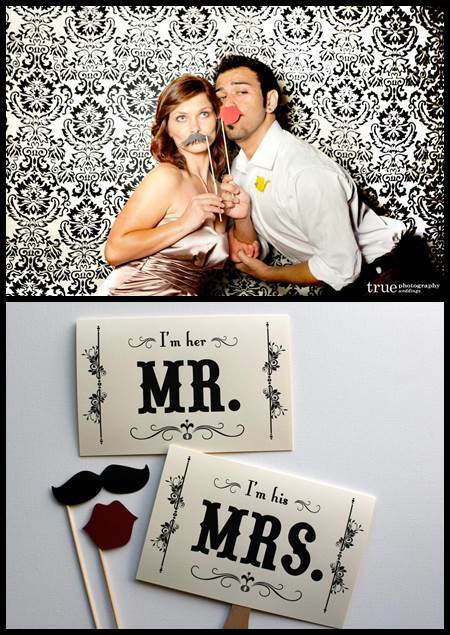 To make your photographer’s life easier, politely ask your guests to “Stache the Flash” via hand drawn chalkboard signs. 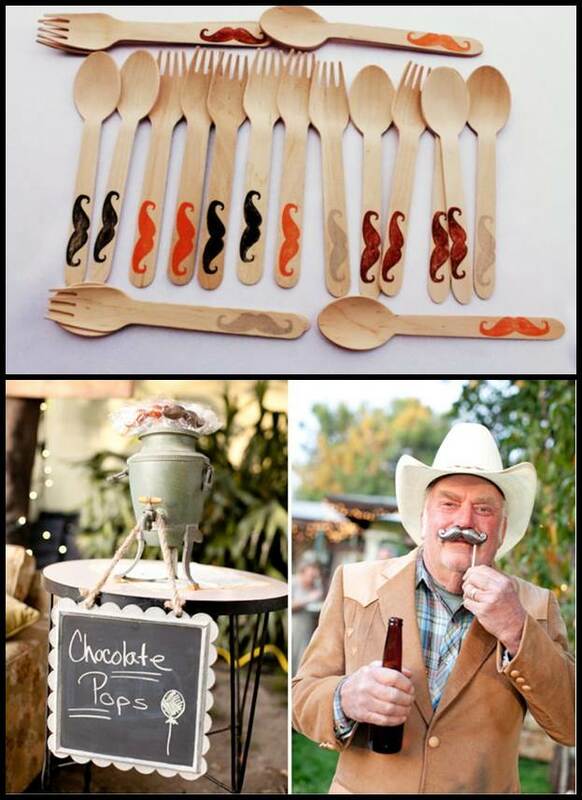 Keep the party popping after your vows by continuing the “Stache Bash” theme into your earth-friendly reception. A few months before the big day, get the male guests excited by offering prizes for the best Instagrammed home-grown mustache pic at the reception. Have your bartenders and wait staff wear the fuzzy things. At the bar, name fun organic drinks after them like the “Havana Handlebar” and “Pencil Thin Pina Colada”. 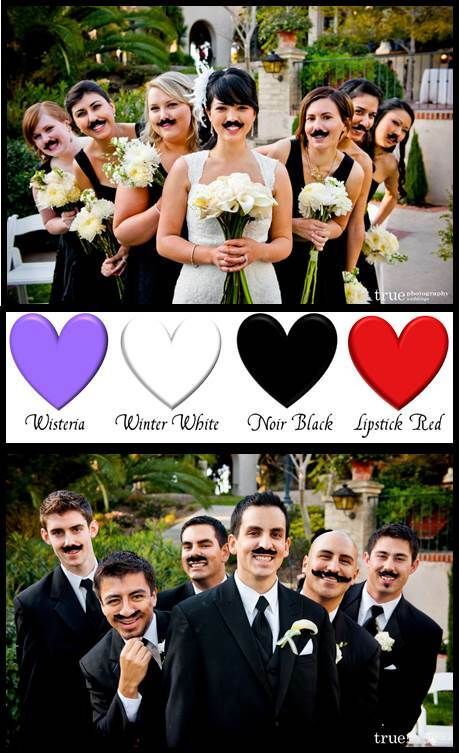 A mustache wedding is the perfect type of wedding to cut down on reception centerpiece flower usage. Do this by creating a large wooden mustache sculpture made from recycled pallets or assembling old photos featuring mustaches found in vintage shops or in your family’s attic. At a “Stache Bash”, you can have a virtual barbershop of sweet goodies. Sweets tables of black and white and your pop color will be a big hit. When it comes to the cake, you have countless decorating options. Again, you can go subtle or strong. Small white buttercream mustaches piped onto a white cake or vintage mustache photos printed on edible rice paper and attached to the cake will make a classy style statement, while cakes shaped like a ‘stache or featuring black mustache decorations will provide a fun and strong talking point. Cupcakes and cookies can also be decorated a la the mustache. 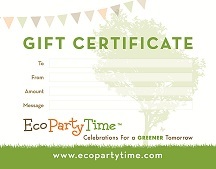 Ecopartytime has you covered with cupcake wrappers, gift bags, and bamboo utensils highlighting the icon of the ‘stache. Usually the photobooths start happening around the same time as the dessert tables start to get busy. Use photo props like the fun ones at Little Retreats or do double duty with your sweets by featuring mustache chocolate lollipops like the ones made by the Frosted Petticoat which can be used for photo props and then eaten as part of your guests’ “sweet stash”.